Everyone's home! Is that a good thing? Yes, of course it is. The down side is that I have to cook lunch. Yes, cook lunch. Lunch has to be hot. That's how we eat in the far East where it is always hot. Why is that? We actually eat five times a day. Sometimes all of them are hot, cooked meals. We tend to eat lighter here in London and we actually don't snack. I have cooked a hearty noodle soup for lunch. It is simply called long soup. 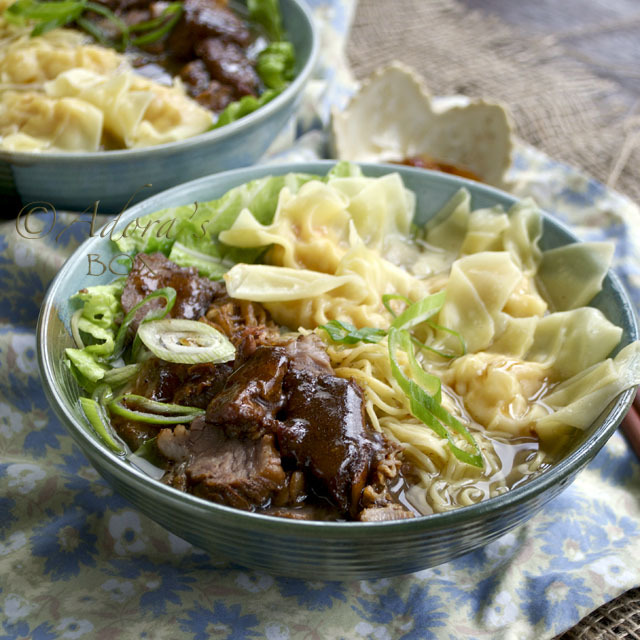 Long soup simply means noodle soup and short soup means wonton soup. This would only qualify as snack back home and even has to be eaten with something else (like steamed filled buns). 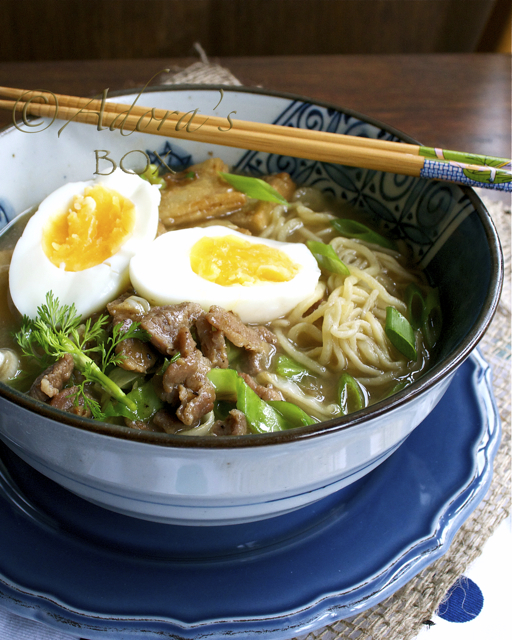 Good, long simmered broth made from pork bones is essential for this dish. The soup alone is so satisfying already. The soup is topped with stir fried pork meat and cabbage and of course the usual spring onion sprinkles. I have added fish cakes and boiled eggs for topping. This is an easy dish and the stock can be replaced by store bought stock. You can improve the taste of store bought stocks by simmering onions, carrots, celery or whatever herbs you like. Cook the egg noodles, then drain. 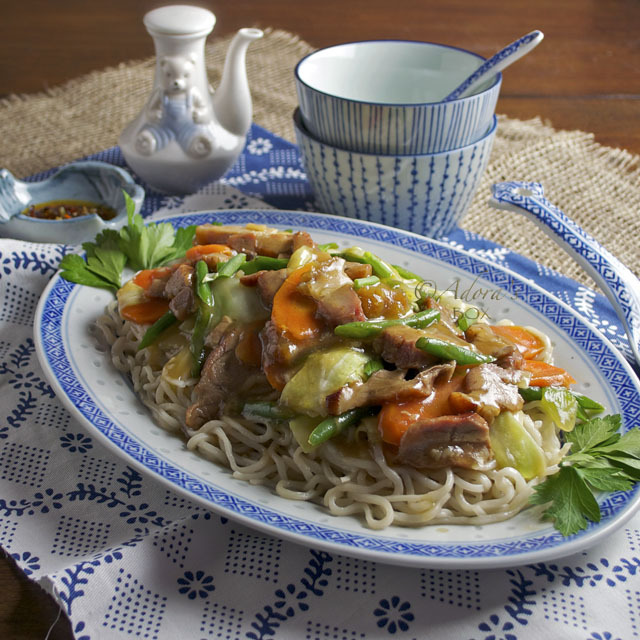 Season the pork slices with the light soy sauce and sesame oil. Heat up a wok and add the cooking oil. Stir fry the garlic for a minute then add the pork strips. Stir fry on high heat for 3 minutes, then add the oyster sauce and cabbage. Stir fry for 2 minutes. The cabbage should still be crisp tender. Transfer to a dish and set aside. This will be the topping for the noodle soup. 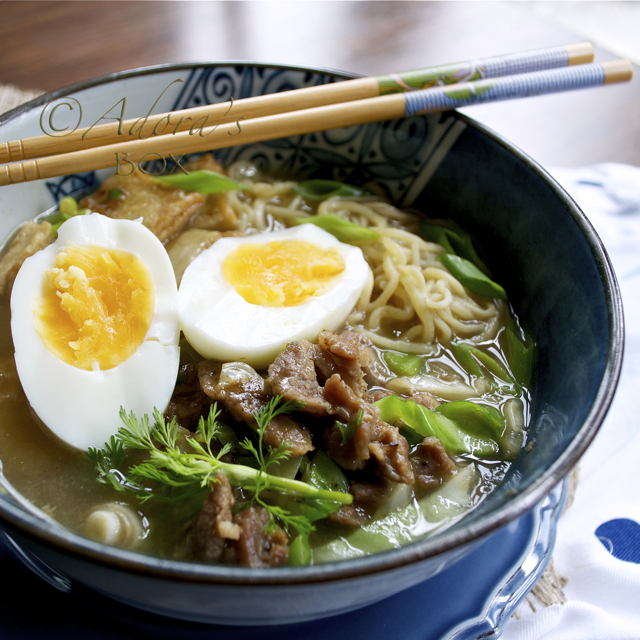 To assemble, divide the cooked noodles into four individual bowls. Top with the spring onions and the fish cakes or balls. Ladle the soup on top of the noodles. Top with the cooked pork and cabbage and halved boiled eggs. Serve hot. Need I say enjoy? Of, course you would. I would love this for lunch, I really enjoy having a hot lunch, even if it is hot outside. Plus I love the noodles. Welcome back..this looks very comforting and i wound't mind this for lunch or dinner for that matter. Also great information Adora..I enjoyed reading more about it! 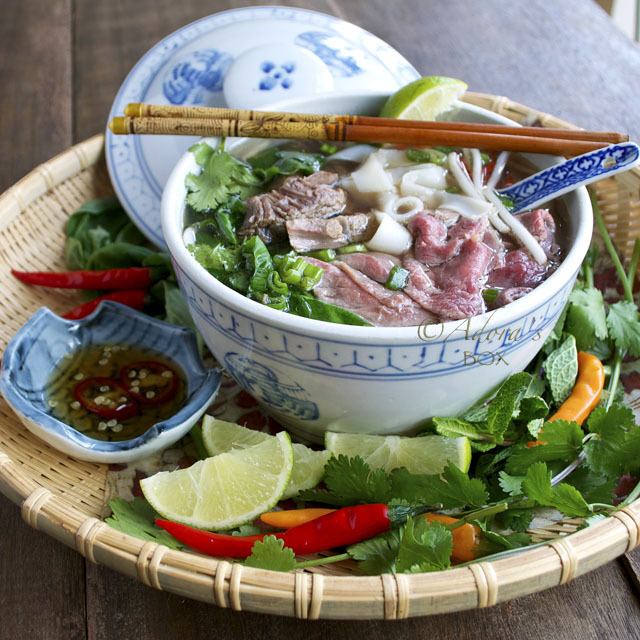 If I ate 5 times a day and the meals are all as yummy as this long soup, I'd forget about snacking too! I love the presentation, Adora, those blue bowls and plate really bring out the noodle dish! This looks so wonderful and hearty! Like the soups my mom used to make, but with more toppings (we'd only get a few fish balls or pork balls). What a great noodle soup! I love the egg on top. I wish I could have hot lunches as well, but (un)fortunately we don’t have a kitchen at my office. If we did I would probably cook for everyone there as well! This looks amazing! I LOVE the egg on top! I love looking at your long soup, Adora! It reminds me of how my mom used to cook our traditional "mami" with lots of toppings! YUM! Your long soup looks delicious. 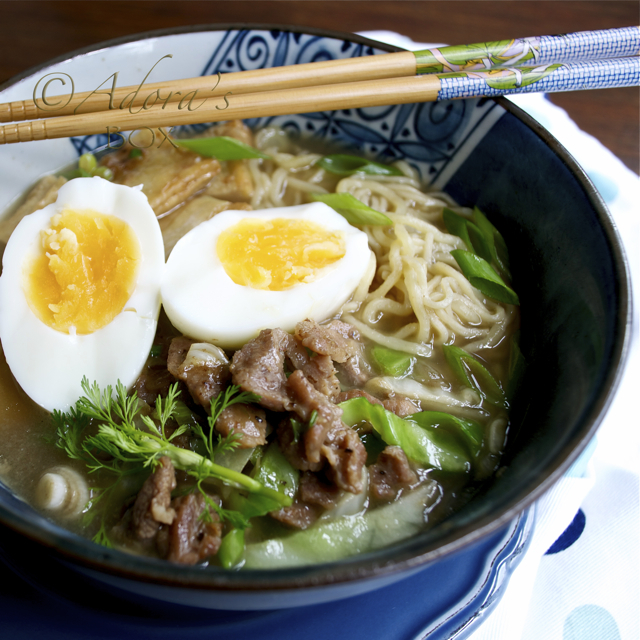 Noodle soups are my go to comfort food so I really want to eat this soup in this pic! Love the way you've presented this soup. I'm passing the Versatile Blogger Award on to you! View the details at http://whataboutsecondbreakfast.blogspot.com/2011/08/i-got-versatile-blogger-award.html. Your picture made me want to run in the kitchen and make this right away! What a beautiful soup!